Music plays an integral role in the various traditions of Buddhism that exist in different parts of the world today. In Chinese Buddhism, scriptures and devotional passages are often sung, accompanied by musical instruments (or Dharma instruments [法器]) such as the wooden fish (木魚) and singing bowl (磬), to praise the virtues of the Buddha or as a form of personal cultivation. Taiwanese ethnomusicologist Pi-yen Chen notes that there are three distinct types of Buddhist music in present-day Chinese Buddhism, namely, Buddhist chants (梵唄), Buddhist devotional songs (佛教歌曲), and commercial Buddhist music (商品佛教音樂). (Chen 2005) While Buddhist chants have received attention from a number of scholars over the years, Buddhist devotional music is still largely unexplored. 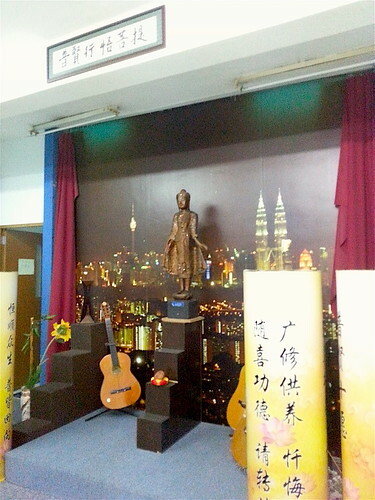 As part of our ongoing research on contemporary Buddhist music, we visited the Bodhi Group (菩提工作坊; Persatuan Penganut Buddha Bodhi Kuala Lumpur) in Kuala Lumpur to learn more about the production and performance of Buddhist music among Malaysia’s Chinese Buddhist community. The Bodhi Group is located on the third and fourth floors of a humble building on Jalan Sultan, right next to the bustling Petaling Street, better known as Kuala Lumpur’s Chinatown. The Bodhi Group was founded by a group of young Buddhists in 1988, who registered the organization a decade later with six objectives: to inspire religious sentiment among Buddhist youths, to use Buddhist songs for Dharma propagation, to foster the production of Buddhist songs and improve the quality of Buddhist music, to gather resources on Buddhist songs, to assist Buddhist organizations in setting up Buddhist choirs, and to promote other Buddhist cultural activities. The focus of the Bodhi Group makes it a unique Buddhist organization in Malaysia. In fact, the activities of the Bodhi Group sometimes more closely resemble those of a church than a Buddhist temple. The weekly Friday service, known as An Appointment with Bodhi (菩提之約), usually begins with the singing of Buddhist “praise and worship” songs, followed by a Dharma talk, a scripture discussion, or a video screening for the congregation, which is mostly comprised of college students and young working adults. The Bodhi Group runs a number of other programs, such as regular Buddhist music practice and a Dharma propagation course. The Bodhi Group has also collaborated with their spiritual advisor Venerable Chuanwen (傳聞法師) to organize a number of Buddhist music concerts since 1999. The first concert series, titled “Praise the Tathagatas” (稱讚如來), was based on the vows of the bodhisattva Samantabhadra. The performances and songs were very well received and the Bodhi Group released albums of their original songs. After a six-year hiatus, a second concert series called “Action” (動) was launched in 2014. The second installment of Action was held in 2016, with a recent encore concert in January 2017. In their recent concerts, the Bodhi Group has incorporated electronic dance music into some of their performances. Brother Wong shared with us that the concerts serve as an important platform for reaching out to young people who may be interested in becoming Buddhists, and also help fundraise for the Bodhi Group. In 2014, a group of Buddhist musicians from the Bodhi Group formed Plan B, a Buddhist rock band. The “B” signifies Buddha and Bodhi. The band, which consists of two guitarists, two bassists, a drummer, a lead singer, and a music arranger, seeks to make Buddhist music “contemporary, popular, and viral.” One of their songs, Verses of Praise to the Buddha (讚佛偈), was released in May 2016 for the Vesak celebration and quickly went viral on Facebook, receiving thousands of views within weeks. Chen, Pi-Yen. 2005. “Buddhist Chant, Devotional Song, and Commercial Popular Music: From Ritual to Rock Mantra.” Ethnomusicology 49, 2 (Spring/Summer): 266–86.